All of your proposals will be recorded for you to accept, decline, and withdraw from proposals in the 'My Proposals' screen. Click on any proposal to expand its display to include details about the proposal and any responses that you have received. Responses labeled as '(Awaiting response)' and '(Awaiting reply)' indicate that the provider indicated in the proposal details has not yet responded to your proposal within the 'Show List' screen. Click on the proposal to view your response options. 'Urgent' indicates that the proposal was marked as urgent by the provider who submitted it. 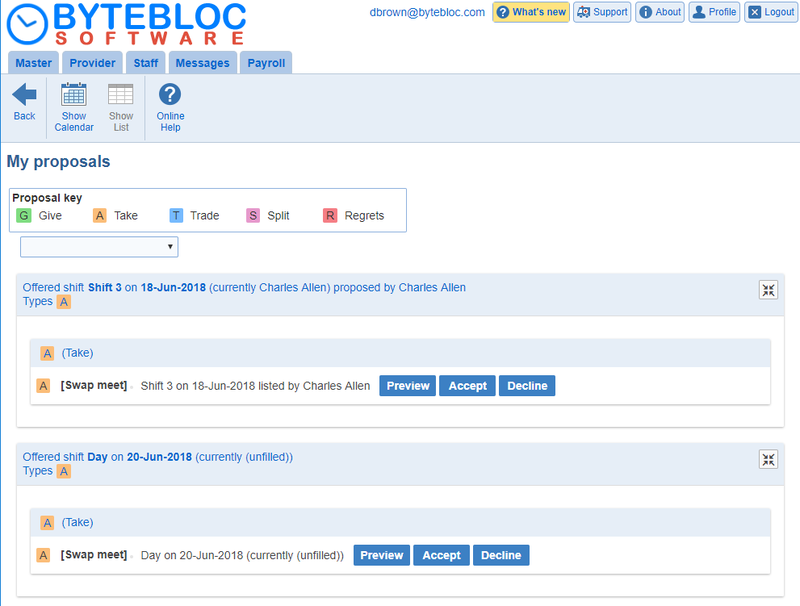 After clicking on a proposal, check boxes to the right of any responses identify the responses to which the 'Accept', 'Decline', 'Withdraw', or 'Preview' buttons apply in the 'Show List' screen. Clicking the 'Withdraw' button when either no responses are checked or none are shown allows you to completely withdraw the proposal (after confirmation) from all providers to whom it was offered. 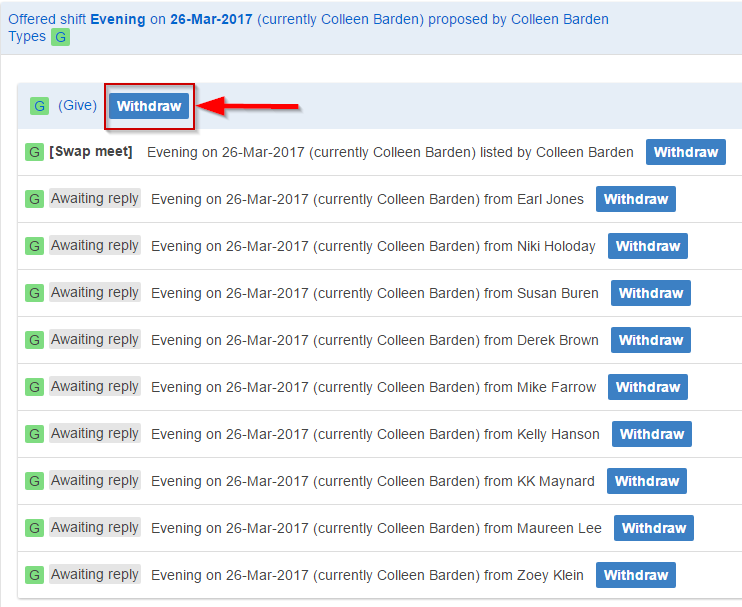 Clicking on a 'Swap Meet' proposal to which you have not received any replies will display only an active 'Withdraw' proposal button, allowing you to remove the proposal from the 'Swap Meet' (after confirmation). 'Decline' (Regrets) are listed only for directed proposals and not for 'Swap Meet Proposals'. 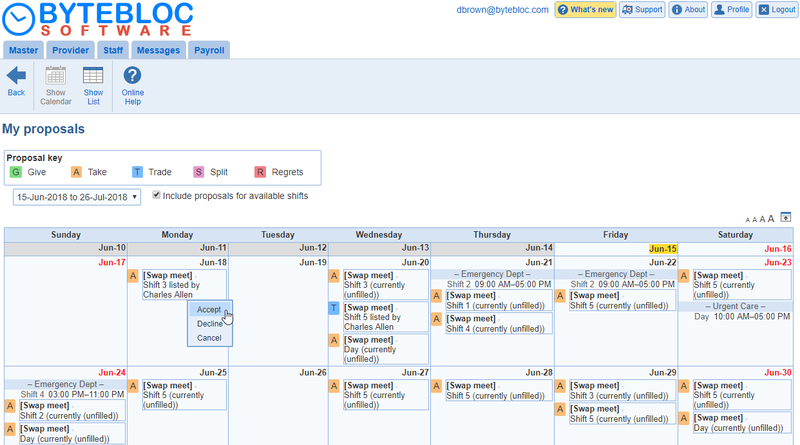 The 'My proposals' screen can display proposal in either list or calendar format. Proposal for available shifts can be displayed in the 'My proposals' screen when the screen is in calendar format. The available shifts shown match those listed in the 'Swap Meet'. The option to show available shifts is a persistent user preference. Click on the shift to 'Accept' or 'Decline' a proposal. The proposal will be removed, a notification will be sent to the provider who initiated the change to let them know it was declined. Regrets: An 'R' will be displayed after you decline a proposal by selecting the 'Decline' button. Give away: Give a shift away and receive nothing in return. Trade: Trade your assignment for another assignment. Split: Split your coverage of a shift with one or more other providers. Swap Meet Proposal: The proposal will be listed as a [Swap meet]. Note: You may need to go back into 'My Proposals' to accept the proposal for the schedule change to be made based on the other provider's privileges. If you see 'Accept' from your view, the original proposer will need to 'Accept' for the schedule to updated in the master schedule. Added 'withdraw' button for each proposal type (give, take, split, trade) in the 'my proposals' screen for each proposal group.